MICK MALTHOUSE's first summer as coach of Carlton is going splendidly. So splendidly, that the Blues are now just one win away from a Grand Final. Carlton made it three NAB Cup wins from as many matches with a 70-point thrashing of Fremantle at Etihad Stadium on Saturday night, and should the Blues beat Adelaide at AAMI Stadium on Friday night, they will win through to the pre-season decider the following weekend. They might even get there with a loss given their healthy percentage. Carlton, which won 18.16 (124) to 1.6.9 (54) looked impressive in every facet of the game against Fremantle. The Blues jumped to 34-point lead at quarter-time and by half-time it was 61 points and all over as a contest. 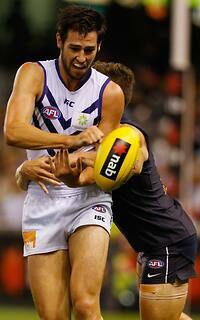 They spanked Freo at stoppages all evening and enjoyed a huge advantage in inside 50s. Leading the way was Eddie Betts, who finished with four goals including a peach early in the opening term where he beat several players, burrowed his way through a couple of tackles and snapped truly from 20 metres out. If there was to be pre-season goal of the year award, he would be in contention along with Majak Daw and Lance Franklin. But the bonus for the Blues was that the goals were shared around. Apart from Betts, the only other multiple goalkickers were Jeff Garlett (three), Bryce Gibbs (two) and Mitch Robinson (two) with 11 Carlton players helping themselves to majors. Emerging key forward Levi Casboult was among them and the Blues would be delighted with his presence close to goal. If he doesn’t mark the ball, he brings it to ground to allow Betts and Garlett to wave some magic. The Blues also dominated the midfield with Robinson (26), Marc Murphy (21 possessions), Gibbs (22), and Andrew Carrazzo (19) all winning plenty of the ball. Gibbs put his hand up over the summer to spend more time getting his hands dirty in the midfield and the early signs are that he will have plenty to offer. Matthew Kreuzer was excellent both in the ruck and a key forward and Matthew Warnock came on as a substitute in the second half and was also excellent. And there was plenty to like about Carlton down back. Malthouse has quickly settled his backline and when the heat was on early, Zac Tuohy, Jeremy Laidler, Chris Yarran, Michael Jamison, Lachie Henderson and Nick Duigan kept Freo to just two goals in the first half. There wasn’t a great deal for Fremantle to be enthused about and skipper Matthew Pavlich can't return quickly enough, even just to present a genuine marking target close to goal. Lee Spurr was brave, David Mundy was dangerous for a time and Clancee Pearce worked hard, but Nat Fyfe had a nightmare of an evening and Hayden Ballantyne, Kepler Bradley and Michael Walters fared little better. Fremantle is back home in Western Australia next Saturday with a game against the Western Bulldogs at Mandurah. Hopefully, Pavlich will be back. He is needed. Fantasy spotlight: Mitch Robinson earned 87 points on Saturday night, boosted by a goal right on the final siren. He gets plenty of the ball each week and his ability to push forward and kick goals makes him a valuable pick up, at less money than superstars Marc Murphy and Chris Judd.